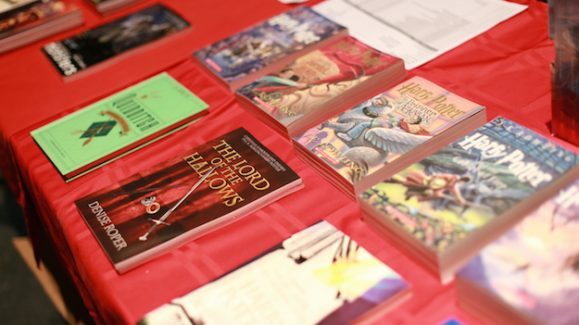 The Newman University English department presented its annual Literature Festival, “Magic Happens: A Celebration of Harry Potter,” April 12 and 13. 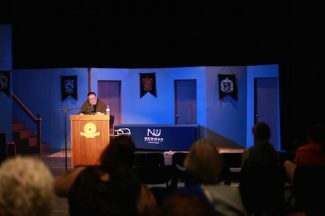 Also known as, “Lit Fest,” the celebration is a two-day event featuring readings from academic papers, various forms of creative writing, live performances and even prestigious guest speakers. On Friday, several Newman students also debuted their works. Associate Professor of English Susan Crane-Laracuente, Ph.D., featured students’ brief written pieces as part of her Short Story class. Junior Maria Somes, who read an excerpt from an original short story titled “Happenings,” said this was her first time presenting and performing at Lit Fest. Following lunch, complimentary copies of the student literary journal, Coelacanth, were handed out and students read aloud from their officially published works. Senior Corbin Riley, this year’s editor-in-chief of Coelacanth, said he thoroughly enjoyed his experience. (L to r) Seniors Trevor Farney, Corbin Riley and Jacob Hobbie read Hobbie’s work aloud from Coelacanth. 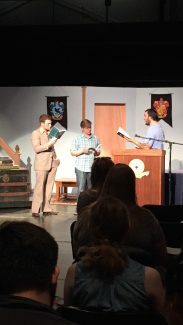 Students in Crane-Laracuente’s Latin II class also performed original live skits. The twist? They performed each scene first with English dialogue, then to a translated Latin dialogue. Somes is also a student in Latin II and said she enjoyed performing alongside her classmates, hearing and watching them and other talented Newman students perform. 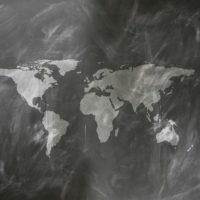 “Additionally, (I liked) being able to use literature and academia as a platform to discuss and explore gender problems and women’s rights and issues still prevalent in today’s society, (because) it is a topic that I am passionate about,” she said. Assistant Professor of Graphic Design and Digital Art Laura Scholl gave a presentation, “Creative Design of the Wizarding World: Harry Potter and the Sorcerer’s Stone.” Scholl explained her experiences in working with the graphic designs and effects used in the movie — particularly with the famous Quirrell’s Mountain Troll, which she helped bring to life on the big screen. The Sloppy Joe Improv Troupe entertains the audience with spontaneous scenes for the final portion of Lit Fest. 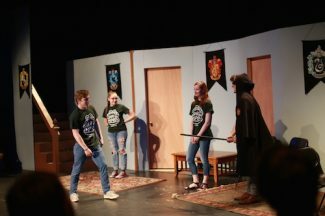 To top off the evening, the Sloppy Joe Improv Troupe performed a show titled, “Harry Joes and the Goblet of Sloppies.” The group took suggestions (some of which were Harry Potter themed) and provided a final segment of entertainment for literature lovers to watch.